Home owners, you may want to skip this one for now. Zillow.com allows home buyers to scope out the value of homes—including both those that are for sale and those that are happily occupied—in a neighborhood. The company boasts listings of more than 88 million U.S. homes, and now it's packaged all that data in a pocketable app. 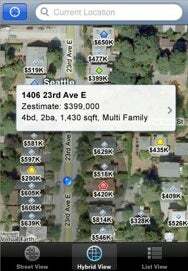 Zillow Real Estate (iTunes link), uses the iPhone OS's GPS features to figure out where you are, then displays a customizable map of surrounding neighborhood homes and what they're worth. You can also search for a specific address, city, or ZIP code, and apply a hybrid view to display more data, like street names. A list view also takes the map out of the picture. If a property is for sale, or has recently been sold, you can focus on the details of the house, even viewing any available photos. Users can also view Zillow’s "Zestimates" (yes, they put a "z" in front of the word "estimate," apparently on purpose), which are the company's own estimates of a home’s worth depending on various factors, such as previous appraisals, market conditions, and more. Zillow Real Estate is available for free in the App Store for iPhone and iPod touch owners.